Turtle Moon Studios. Susan Shie. 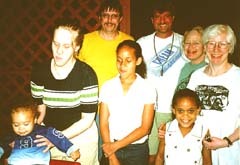 Turtle Trax 7-24-01. Turtle Trax Diary. Page 33!!! Above is about half of the top lid of the box we did at CraftSummer at Miami University this month. Can you tell it's me? If you like, go to Page Two of this diary entry. Topics in this diary: Starting the garden, Quilt National, "St. Quilta Garden Blessing", Turtle Art Camp May 30 - June 5, start of the next Kitchen Tarot card quilt "The Cream and Sugar / Lovers", new scarecrow named after Aunt Louise, the Acord Reunion, eating at The Parlor, a new piece "The Queen of Cups", fading front door, CraftSummer '01, a new box "Ammo / Amore", Co-op painting. We broke ground officially on Mama Wanda's birthday, May 11, when Jimmy ran the little Mantis, Hennie Pogo, for several sessions over a few days, to till up rows in the Rainbow Garden. By the time Robin Schwalb got here from Brooklyn, to help us plant and go together to Quilt National's opening in Athens, OH, we had a few things in the ground, but not much. We'd hoped to have it almost all done, but it was such a cool, rainy Spring! In the photo above, Jimmy's running Hennie, and Robin in the background is sifting rocks out of the tilled dirt. I was happy to find a bunch of volunteer cilantro plants growing here and there, and managed to rescue them from being tilled under. I planted them in a nice long row, but later the rabbits attacked them! Robin heard later that if you put slices of gold Dial soap around plants rabbits want, they'll stay away. Now I have a scraggly row of cilantro, better off than it woulda been, had the bunnies had their way. It would now look like mown grass in that row! Our Russian penpal Ivan tells me there are no rabbits in Russia. Shall we start a fund to ship a bunch of them over?????? 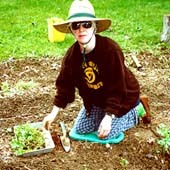 Above -- Trendy fashion wear for gardening: Big hat, long sleeves, boots or plastic clogs. Kneeling pad is a must, in order to save the knees of your pants! We also like the Fiskars ergonomic trowel! You can see the oriental poppies coming up, toward the road from Robin. Here we are at Quilt National '01 at The Dairy Barn Southeastern Ohio Cultural Arts Center in Athens, OH, about four hours southeast of Wooster. I look like I'm still in garden mode here, don't I? Oh well, it wasn't the opening, but the morning after, when we were all wearing comfier clothes again. Jimmy's got on the green fly fishing shirt he put too much bleach on and turned purple! He couldn't do that again, to get that same effect, if he had to! Everyone loves that shirt! 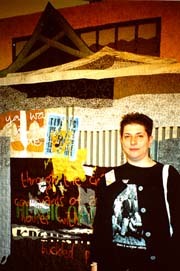 Here's Robin and her own QN quilt "Heroic Optimism," which won the Domini McCarthy Memorial Award. This piece is part of a series Robin is doing about images from her trip to Russia a few years ago. "...ripped wall posters on the crumbling facades, contrasting the party line of a social realist cityscape with the rich interior lives of its inhabitants." And yes, she had worked on it at our house! Keep that magic going, Robin! We love it when you come out! 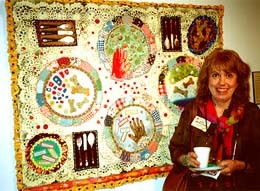 Here's another really good friend, Jane Burch Cochran, with her quilt "Paper Plates and Bone China, Some Hand Painted." She used fortune cooky tapes, which are some of my favorite things in the world! And Hattie would love to sit down to this meal, with dog biscuits front and center!!!!! 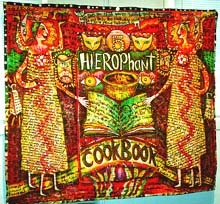 Our piece in the show is "The Cookbook / Hierophant: Card #5 in The Kitchen Tarot." In a gallery or museum, people can't lift up the central panel, which is the actual card, and see the whole painting underneath. So now it's just a nice mystery. I really like the idea of the Turtle Moon Test Kitchen, where we experiment with lots of things, including yummy recipes for a good life! The more I get into this Kitchen Tarot thing, the more it makes me feel good. I love kitchens and their tools and gadgets, and the warmth of the interactions going on in the kitchen. Later in the diary you'll see the start of the next card quilt, "The Cream and Sugar / Lovers." 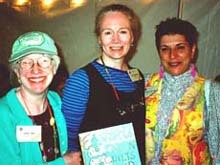 Here are me, Jane Sassaman, and Robin, with the 2001 GREEN QUILTS Award. 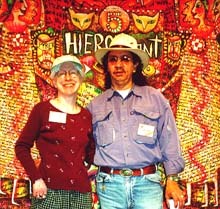 At every Quilt National, Robin and I work very hard for two days, to decide who gets the covetted GREEN QUILTS award. We get busy as soon as we get our hands on the catalog and the quilts, and we read all the statements, to see whose work best represents the ethic of the GREEN QUILTS project. The artist must be at the opening, so we can get her up on the famcy folding chairs stage we create at Hilary and Marvin Fletcher's house, the night of the Pizza Party. And we hold this little ceremony, which is a separate awards ceremong from the official QN one. This time we awarded the GREEN QUILTS prize to Jane Sassaman of Chicago, whose quilt "Metamorphosis" can be seen on our June, 2001 GQ Update page, and of course, at the real Quilt National site! You can read Jane's statement about the quilt, which lead us to give her the prize, on our GQ update page, too. Jane has been a participant in this environmental healing project for many years, and all her quilts speak to the balancing and restoration of the earth's wholeness. The crowd was totally delighted with our choice! The prize had been a potholder sized quiltlet made by me, for the first three times we gave this award. This time we switched and I made a painting on matt board. It's bigger, and I had more time to pack, hang out with other people at QN, etc, since I wasn't sewing frantically on the award! Well, this could be a GREEN QUILT, only it's a painting I did this summer on wood. 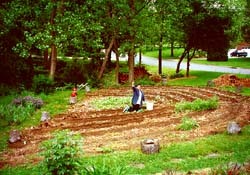 "St. Quilta the Comforter Blesses the Garden" is 24" square. It includes our patio owls, the oriental poppies that were blooming in June, St Q's grater and pincushion, her green glass Pyrex measuring cup, and her favorite cat Marigold. 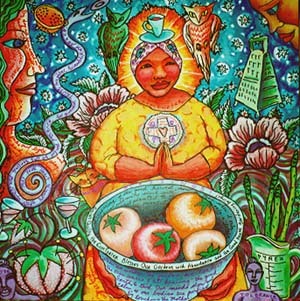 She's got a big bowl of various colors of tomatoes, some asparagus, and some good vibe guides. Oh, there I see the goblets of merlot that Jimmy and I share at bedtime, celebrating the joy of life. I really like painting on wood, but it's very tricky to photograph, because its smooth surface makes so much glare. I now have six stretched canvas panels ready to paint.... Funny, I gave up using canvas on stretcher bars in college, because I wanted to work more portably, and thus ended up making quilts. Now I'm coming full circle to what I painted on all the way back to high school! Don't know yet what will be the theme of the canvases, but they may be more Kitchen Tarot card images. We had a great time with Susan Lumsden of Thayer, MO, and Marlene Glickman of Clearwater, FL, for our May 30 - June 5 Turtle Art Camp here at home. 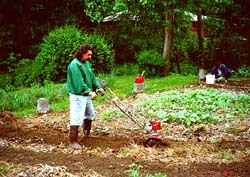 Special things about them included great interest in cooking as well as gardening. Very nice and earthy week! Here they sit with all the work we made during their camp week. You know, that last project where the students create a mock quilt out of all the stuff we've started. They did a great job of both making lots of art pieces and of arranging them. Note especially Marlene's lovely shoes! She found white mary janes at the local Indian store, and she painted them all up with a diary of our week! This is the back of one of the tee shirts made in camp by Marlene, Susan, and me. So there were three shirts in all. (Jimmy participates by troubleshooting the airbrushes, but he won't wear stuff like this.) 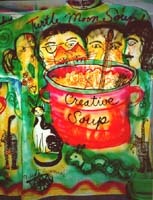 Here you have all four of us, drawn by Marlene, looking into the big soup pot of creativity. Marlene had made a big soup one day, so this is the reminder. (A real gourmet soup, not one of my Kitchen Sink Soups.) Susan had made tomato worms out of Fimo and Cernit polymer clay, so you'll see one of those rascals below the pot. Tulip and Willy are walking around the soup pot, trying to put cat hair into the soup! 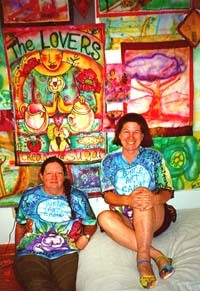 Here is the front of one of the shirts, as seen modelled by Susan and Marlene, in the photo two shots back. 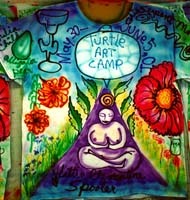 "Turtle Art Camp" is written on the shell of a big turtle, who floats over a path of garden flowers, especially poppies. 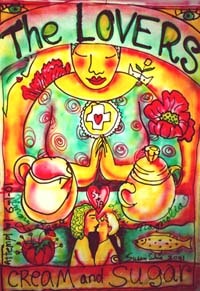 A big purple Earth Mama sits there in meditation, while a giant margarita floats off in the sky! An alligator pear and an Ohio serpent mound grace the sleeves. Very stylish, yes? This tee shirt project is included in our camps, as long as the students want to do it. It takes several days of work, with each student taking several turns to add something to each of the shirts, as the design builds up. (Other projects are going on at the same time, as we usually work one at a time on the shirts.) All the shirts are "identical" and all are unique, in that each image is done freehand, but is the same image in the same place on all shirts. You really learn a lot about airbrushing, and you have a lot of fun! This is a painting I did on fabric as an airbrush demo in the May/June camp. It was labelled "first attempt," because I thought I may not want to use this one for the next Kitchen Tarot card quilt. But I liked the design just fine and sandwiched it with batting and backing, as my painting-into-quilt demo a day later. It's called "The Cream and Sugar / Lovers: Card #6 in The Kitchen Tarot." It's about 3' x 2' and is now partly sewn, tho in the photo here it was just a painting. I used my Fiesta Ware cream and sugar as the models. And I forgot to include the #6 in the design, so I'll have to create a whole new top section that has that in it, since all the Kitchen Tarot card quilts have the number of the card included in their designs. So I'll eventually get around to fixing that! You can see it's St Quilta blessing Jimmy and me. I think she's showing up in a lot of the images for this deck, and that's good, since she's a real Mom figure for me. Mom and her kitchen are so big a part of my home feelings! Speaking of Mom, here is a sad story of her little sister, my Aunt Louise. Louise had Parkinson's Disease. She lived in Texas for many years, so we hardly ever saw her. She took a severe turn for the worse this Spring, and died June 11, during the big flood in Houston, due to fatal symptoms of her disease. She was my favorite aunt, the one I had the most in common with, the artist in that generation of family, the one interested in astrology, reincarnation, etc. You can imagine the wonderful phone chats we had, stewing over Mercury retrogrades, etc, rejoicing over the good matches shown in the charts of our kids and their spouses. Aunt Louise was the wild aunt, of all the Mennonite relatives. She worked for the US Foreign Service for many years, sending us nieces and nephews exotic presents for Christmas. We still have the camel saddle she sent Mom and Dad from Saudi Arabia in the early 60s. Anyhow, she died at 74, which was really unexpected, and we miss her very much. She left Uncle Charlie, cousin Tom and his wife Carolyn, and two granddaughters, Danielle and Lauren. Like Mom, Aunt Louise had a really big, warm heart and was very sweet. So, how to honor this wonderful aunty? First effort was to build the new scarecrow for our garden and name her Aunt Louise!!!!! Jimmy built too tall of a frame for her at first, and she hovered over the garden like an angel, too far in the air to be mistaken for a woman out there working. He had to cut her down to size and then pound her in, so she wouldn't fall over when the garden got soggy. This Louise has some clothes that were mine, and are probably wilder than Aunty would have chosen, but I hope she appreciates their cheerfulness, which is what I meant to convey of her spirit. Our friends Kerris Skyye, Nelson Broadway, and Elizabeth Owen (Issie) helped us put her together. Issie was here for five days and the boys for two, which was really fun. I'd tried for months to get the scarecrow made in camps here, but it wasn't meant to be, til after my aunt died and these dear friends were here to help. Here she is in mid June, presiding over the budding garden in all her glory. Just the oriental poppies were blooming then. Not even the borage was up very much yet. The pumpkins had a start, thanks to that soap tip Robin gave me. You should see it now, the July garden! You will see it on the next diary, but rest assured that it's doing quite well now, being watered each evening, and there are no ground hogs right now! Amazing! OK, here's the group that went on the Haunted Lighthouse walk in June: Omari (well, we took turns carrying him), Aimee, Nelson, Jessica, Kerris, Issie, little Teresa, and me. Jessica and Teresa are Aimee's little half sisters who live in Florida, who've been staying with her all summer, as she finishes nursing school. She graduates with her LPN license on Aug 2, six days before she turns 21! Her sister Sharon graduates with her! We're so very proud of them both!!!! Anyhow, this group, except for Kerris and Issie, (who fizzled out and sat and talked on the patio), went on the Haunted Lighthouse walk in the dark, with flashlights, and everyone had to touch the haunted lighthouse and talk to LeRoy, the star of the ghost stories I used to make up for the kids when Aimee and her sibs were little. LeRoy is a made-up dead Amish woodcutter, who terrorizes our town, tho almost all the citizens here don't know a thing about it all. LeRoy now lives in the lighthouse in our neighborhood, but his other haunt is the statues on the courthouse, where he decides who he and his dead brothers should eat, as people walk by them, thinking they're safe. Yes, it's stupid, but we have fun with it. And then, after Issie and Kerris and Nelson's visit, Jimmy left, too, to go fly fishing at Grayling, MI. He does that every year, hanging out with his Trout Bums pals, who build bamboo cane fly rods by hand. He makes the hand built cases, so they all have a big love fest. I sit at home and miss him, but I get work done, so it's all right. I went to the first Acord Family Reunion, while he was gone. Couldn't miss it! I rode with Mama Wanda and our niece Lisa and her daughter Tazia. Relatives came in from all over the country, and it was good to see them all, tho I didn't really recognize some from before. Just like with all families, you have to relearn who some of them are, as we all change so much between visits. A few days later Jimmy came home, and we went to The Parlor to celebrate his homecoming. Here's our favorite waitress, Gloria, bringing our breakfasts! She once rode the bull at Gilly's in Texas! She's always so cheerful, we are happy to have her be our waitress, tho Tracey is great, too, and so are the rest. It's one of those places you just hope will never, ever close down! And I was having one of my last cups of coffee (for who knows how long?) I just decided my health could use me getting off caffeine, so about a week after this, I quit. I thought I was doing it gradually, but got those caffeine withdrawal headaches for about two weeks anyway. No fun. But now I'm all cleaned up. I drink my vinegar and honey tonic first thing in the morning, like I always did, but I don't have to worry about getting some coffee into me before I go out for the day. And I drink more herbal teas, now that I don't need to sip coffee all day, for my slow caffeine drip. I was doing about two strong cups a day, drug out over the whole day. Yes, cold coffee! And no more green tea, which is caffeinated, too. And by the way, decaf has half the caffeine of regular coffee, and caffeine kills off vitamins. End of middle aged lady rant. Go to Page Two of this diary entry.